All talk here about the latest Trekkie show. I liked the original ones. I haven't kept up with any of the follow ons. Are they any good? Just went to have a look at your link. I see it's Discovery now. And Captain Lorca ... yum yum. I quite liked them all, but the last one with Scott Bakula was probably the weakest. First episode of the new series is now available on Netflix. New episode every Monday. Ok, well I've just seen the first two episodes of this new series (the 2nd ep is also available on Netflix) and at this stage I sum it up by saying its a work in progress. The story is told through the eyes of the first officer, rather than a captain, and it stars one of the actresses from the walking dead. She plays a character who, although human, was brought up by the Vulcans and in particular by Sarek (Spock's dad) played by James Frain. This story is about the Federation's first encounter with the Klingons after a 100 years of no or little contact with them. The Klingons feature heavily in these first two episodes and I understand they are central to the while series. If you're expecting the Klingons of old, think again! They've had a complete makeover. They look different and wear very ornate clothes and seem extremely religious. Yes, I still talking about the Klingons here. Anyway, I'll say no more as it may ruin the story for you, but other reviews I've seem label these two episodes as a prologue and I think that's correct, as one of the main character in this series, the Captain, played by Jason Isaacs, didn't feature at all. I don't know if you have ever seen Caprica, the Battle Star Galactica prequel series, but it has that kind of feel to it to me. A lot of the style, including lens flares, has been taken from the new Star Trek films, but this even feels different to them, so far. Look forward to next week when the series starts "proper" with the Captain, but it will still be the first officer who's point of view the story is told from. I give it 6 out of 10 for these first two eps. My TV viewing is a matter of feast or famine at the moment but I have managed to watch the first two episodes and felt that they were an introduction to the series and I am looking forward to watching how the story unfolds. I agree Jo. I like Jason Isaacs, so look forward to seeing him in future episodes. From what I've read the series is a single main story rather than a number of individual storys. I like that sort of format as it evolves over time. This current format with American tv started about ten years ago (or more) and it is nice to see a story evolve over the course of a series. But I do like individual stories too. I have happy memories of watching Stargates, or Star Trek series' while doing the ironing or something else, because if you miss something, it did not effect the enjoyment of the next episode. Although the individual stories in the original series were inventive I found that in the later spin offs that they ended up having a story each episode based on one of the main 5 or 6 characters in rotation and for me it was boring. Not enough strange aliens or weird space storms or planets. Nowhere enough phasor / photon torpedo action. I quite enjoyed all of them, perhaps Voyager being the least favourite. I warmed to Deep Space Nice after initially hating it. But TNG was still the best, for me. I think you've hit on why I don't share the general love for all these US TV series that are floating about. I tend to forget who did what and who's who so get confused and bored. I prefer either a film or a self contained episode. Just watched episode 3 and I'm hooked. Loved the Alice in Wonderland 'rabbit hole' sequence and the glimpse into what is in t Captain Lorca's Ready Room. Also intrigued by a statement by Burnham that after she was orphaned she was brought up on Vulcan by a woman called Amanda who use to read to her son and Burnham. A bit lost on the time line but wasn't Spock's mother called Amanda? Just seen ep3 myself, Jo. It's certainly different has the re-imaged vibe of battler Galactica to it or Caprica, some Fringe, Lost, other elements. Not the clear cut, 2D world of Trek we're used to. As to your query in your spoiler, having just seen the "after show" on Netflix, (NOTE TO ALL: Avoid it like the plague, it's awful and they forensically examine every detail and basically ruin the magic of it.) the answer is yes. Cheers H I must admit to wondering if my memory was playing tricks and making up links to other Star Trek characters. I did let the programme roll on after the first episode and caught a short look at the aftershow and quickly switched it off, not my cup of tea at all. I hate it when things are examined to death, taken to pieces and over explained. A hang over from doing English Lit, totally ruined my enjoyment of Shakespeare's use of the English language. There. Explanation done for them. Saw ep 4. I don't like the "new" Klingons, they're just not Klingons to me. I'll stick with the series, but am pretty luke warm to it at the moment. Kind of felt like an 'info episode' laying in a morality layer. 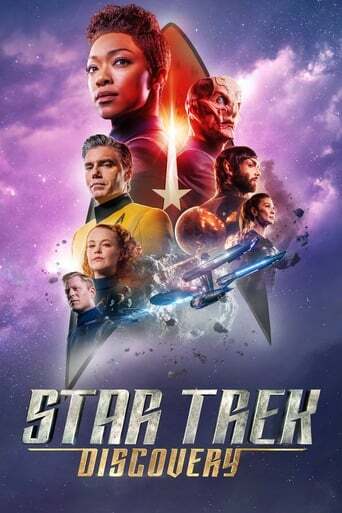 If they're going to start down the morality road, then fine, that's like old Trek, but I thought that the show was going to be taken in a new direction, especially with a war monger captain at its helm. There has to be a reason why the new Spore Drive wasn't used in the previous series set in the future. I guess coercing the Alien will prove to be ethically unacceptable to Michael making future friction between her and the Captain an on going feature. Hadn't even realised about the spore drive not being used in the future. You've got it all worked out Jo! They're going to have to come up with better ideas. You got that spot on, Jo. Have you seen the latest episode, ep4 yet? It's pretty good. I have just started to play catch-up with my recordings and forums so I haven't watched episode 4 yet. I can't believe how much stuff I have to get through. It looks as though I will be home most days for the next couple of weeks so look forward to catching up with what you have all been up to. My next stint in hospital is at the beginning of December and fingers crossed the ward I am due to end up on has decent wifi so I can keep up with some of my series using Netflix and keep an eye on what all my virtual friends and acquaintances are up to on line. The latest episode (which I've only just seen) was a bit more traditional Star Trek. They actually did a bit of trekking for once! They went to a planet and did their "stuff". Just settled down on this dark and dreary day to watch the latest ep of ST and it's not there! Next episode is on the 8th January! I didn't mind Netflix going down the road of a traditional channel in the sense of showing one new episode a week, but this is too much like how the main American tv networks work. They run out of episodes, so take breaks mid season so that new ones can be made. Terrible way to do it. Make all the episodes first, then show them. If Netflix keeps doing things like this, they may lose their popularity. It was always about "binge" watching. How can I binge ST if I have to wait several weeks for the next episode? I wait for a series season to completely finish before setting down to a binge watch. Star Trek is back! New ep already on Netflix with more new episodes each Monday.